It’s been a busy week already so yesterday, I had an email conversation with Sarah, who heads up Too Cute Tuesday in Saint Louis because I was feeling a bit more uninspired than usual. “Making butter is always fun.” she said, and her group did this a couple weeks ago. That Sarah, she’s good! 1. Pour whipping cream in a jar (about half full) and stick in a few marbles or popsicle sticks. (The marbles or sticks may help get the butter agitated quicker, though in our field testing, having the marbles didn’t seem very significant in terms of getting butter quicker.) If you are feeling a little silly, add a few drops of blue food coloring. 3. Pour or strain out buttermilk and immediately pour the butter back into your jar. Stir in anything you want for flavoring. At the very least, you’ll probably want salt but you can also make it fun, like honey, maple syrup, and more. 4. Put in the fridge to chill if you want it a bit harder, or spread and enjoy fresh. Nate has promised me to send photos of the blue butter on his bread which I’ll post on the Facebook page for all to see. Aren’t you crafty, and like a pioneer? Too Cute Tuesday is a weekly craft night involving friends, projects, and cocktails. To learn more, check out the Too Cute Tuesday archives or find us on Facebook. Too Cute Tuesday is a weekly event involving a craft, a cocktail, and friends. To get crafty, check out the Too Cute Tuesday archives, follow Too Cute Tuesday on Facebook, or contact Nicole about crafting (we have a chapter in Saint Louis for example– wohoo!). 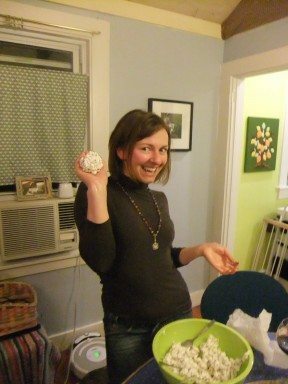 Jessica demonstrates the ease at which popcorn balls are created. Remember, pink sprinkles make everything more fun. 1. After a conversation with sometimes Too Cute Tuesdayer Jessica over the weekend, decide to incorporate a clothing swap into the night’s craft, which happens to be popcorn balls. 2. See that Too Cute Tuesday Saint Louis has already found a rockin popcorn ball recipe. 3. Clean out closet, resolving to get rid of at least 25 articles of clothing. Get rid of more, cleaning is fun! The final products, and in the corner this week’s impulse purchase of People magazine. A good night indeed since it also involved a Snuggie. 5. Melt syrup, water, sugar, butter and marshmallows over medium heat. 6. Once melted, stir into popcorn, coating all kernels. Cover hands in butter, because it’s fun, and shape into balls. Wrap in waxed paper. “It needs something.” Jessica says. Add pink sprinkles because “Why not?” Jessica is a pretty quotable crafter! 7. Drink more red wine (antioxidants!) and try on each other’s crazy clothes. Jessica loves Nicole’s leopard print snuggie and Nicole love’s Jessica’s ridiculous tank top. Everyone goes home with a few new things and the rest will go to charity later this week. 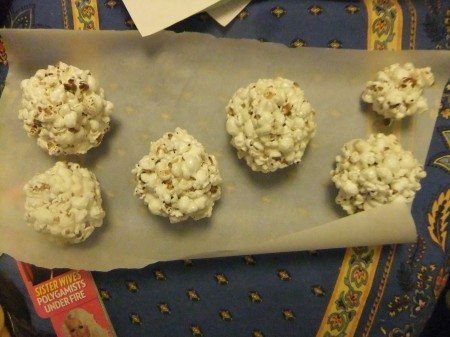 Seriously, these popcorn balls are fan-tastic. Seriously, way better than I expected. And so easy! Aren’t we crafty, and just a bit silly? The cake will rise over the top of the cup. Don’t be alarmed. OK, directions. Besides, it’s Sue’s microwave anyway! My Vinalhaven friend Meg sent me this recipe for microwaveable chocolate cake. Some have called it the ‘most dangerous recipe in the world’ because basically once you discover it, at any moment you are five minutes away from chocolate cake. Since we had several birthdays in the group in the past month (and I had a really crazy weekend as a bridesmaid), this seemed like an easy craft to relax with friends and get back in the swing of things. Sam examines her cake. She is a bit skeptical but it turned out delicious. Sue stirs it up. Yup, that is as complicated as it gets. 1. Mix the three dry ingredients in a big mug. Pour limoncello in separate glass. 2. Stir in egg. Then add milk, oil, and vanilla. 3. Stir in extras, if you desire. 4. Microwave on high for three minutes. the directions warned it might go over the mug and it does if you have a shorty mug like I do. Sue and Sam’s cakes did not do this. You can eat it out of the mug (uncivilized) or reversed onto a plate with ice cream and fruit (much more civilized). I also appreciated the controversial nature of the cake. The original recipe is supposedly over 1000 calories but there were some good suggestions to cut down the oil (or substitute it for apple sauce) and substitute whole wheat flour and use egg substitute. We didn’t use applesauce because Sue’s allergic and because I didn’t feel like going to the grocery store. In other words, you can modify this as necessary to feel less guilty or just share it with someone. I asked Nate’s Magic 8 ball app if I was going to eat the whole thing. It said ‘Yes’. That’s a good future predicting application because I totally did! Aren’t you crafty… and an easy baker! The whole shebang started on Saturday night when I got a phone call from my sometimes lobsterman boyfriend. “I’m bringing you six lobsters.” It was a good catch day and so Dan got to take some (not a usual thing). I tried to make my own ravioli dough. At the point, I left to buy won ton wrappers. Problem solved (and stressed diminished) for $2.50. Of course it was nice to meet some of Dan’s friends but Sunday, we also had friends over for lunch who are ‘sick of lobster’ from serving it to out of town guests all summer. In other words, Sunday afternoon, Dan Dan the Lobsterman went back to fishing for the week and I still had two lobsters and a couple ‘sauces’ left. I decided to make lobster ravioli so that I could use what I had created in terms of Saturday evening sauces and try something besides boil and serve. Sure lobster is good boiled (especially with rice wine vinegar and butter!) but Too Cute Tuesday is all about trying new things! I ended up modifying this recipe on the Food Network for Lobster Ravioli to not have to create the dough (not to say I didn’t try of course but see steps below to see where I went wrong). Tonight, it was just me crafting… in other words, nothing stopping me from consuming a large amount of pasta unattended. 1. Cook and clean two lobsters. 2. Put butter and oil in a pan and melt. Add shallot and cook for 2-3 minutes. 3. Add brandy and white wine. You’re supposed to flambe it but being scared of an open flame, just let it cook on the stove 10ish minutes until a bit syrup-y. 4. Add lobster to the mix and cooked until warmed through. Turn off the heat. 5. In a bowl, put eggs, marzopone cheese, basil, nutmeg, salt and pepper. Add lobster mixture and stir it up. 6. Try to make the pasta dough from scratch without a pasta maker. Guess what? There is no way you can roll it that thin. Trust me I tried… and then I went to the grocery store and bought won-ton wrappers. Problem solved for $2.50. 7. Put lobster filling in wontons (and some in the dough you tried to make for experimental purposes) and seal. Boil until the ravioli float, about five minutes. Take out with slotted spoon. Serve with one of the sauces from this Bon Appetit recipe. Aren’t you resourceful, and taking full advantage of Maine lobster during a gorgeous Maine summer? Every Tuesday, it’s friends, a craft, and a cocktail at Too Cute Tuesday. Get in on the fun, start your own TCT chapter, check out the archives, or connect with us on Facebook. I just got back two weeks ago from Savannah Georgia, home of River Street Sweets and their wonderful pralines. I bought some for Chef Dan and proceeded to eat them all in the hotel room (shhh). 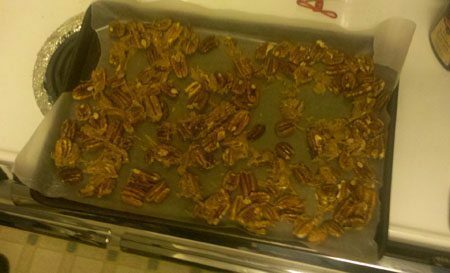 I brought him back some pecans (in a sealed bag) and vowed to make some pralines when I got back home. Then, I proceeded to sprain my ankle for the third time this summer. Thank goodness my pantry is stocked and Chef Dan only needed to pick up two of the ingredients on his way to Craft Central. Also, thankfully, there wasn’t too much involved in praline making and people were able to 1) relax and give me sympathy for my injury and 2) recover from last week’s epic craft failure, the first in Too Cute Tuesday’s history. As Sue said of the experience, “Our crafting egos needed a reality check anyway.” True. But we were back on game tonight with this super easy craft. Dan whipped us up a signature drink: The Sad Lemonade to celebrate him finding blue curacao in our geographic area (for those wondering, Global Beverage Warehouse in Ellsworth). Looking for something non-alcoholic or just more southern? Try the sweet tea recipe I was going to make before I got gimpy. 1. 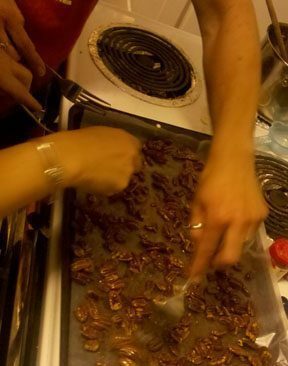 Put everything except pecans and vanilla extract in a saucepan. Stir and heat until 236 degrees. Take off heat. 2. While cooling the ten minute period, drink Sad Lemonade and relax. 3. After ten minute period, stir in nuts and vanilla until the mixture ‘loses some of its gloss’. Plop on wax paper. 4. Laugh as Chef Dan pours the mixture, creating several large pralines instead of small dainty ones. Proceed to eat in the middle of them, creating borders. 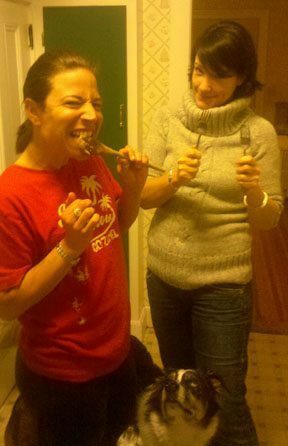 Have a friend offer to lick the pan out ‘so you have less to wash’. I love when eating large amounts of sugar can be passed off as helpful. Even Jessica, who is a total healthy nut, took some home. Yup they were that good! Aren’t you crafty… and unable to resist sweet southern treats!